What is Equine Sports Massage Therapy? Equine sports massage therapy (ESMT) is a therapeutic, hands-on massage technique used to improve the health and performance of horses. Documentation of use of this therapy is found in vet books from as early as the 1800’s. In recent years, it has gained acceptance as an important component of the care of horses. Due to injuries and “old age” in the horses of our barns, Ann Melander and Elizabeth Wilson decided to invite Karen Wilson, an Equine Sports Massage Therapist from the Twin Cities, up to the farm to do a clinic on massage therapy and to work on several of their horses. Numerous vets had recommended massage therapy for the injured and aging horses. Karen was the nearest equine sports massage therapist. The work Karen did resulted in dramatic improvements to the horses. Ann and Elizabeth were inspired and they decided to learn this type of therapy themselves. So, in June of 1997, Ann and Elizabeth traveled to Round Hill, Virginia and learned the art of Equine Sports Massage Therapy. They received and completed their training under the instruction of Mary Schrieber, founder of Equissage, Inc.
During the 1980’s, certified human massage therapist Mary Schreiber studied with Jack Meagher, the pioneer in equine sports massage therapy. His success with applying massage techniques to thoroughbreds was outstanding. Incorporating the skills she learned from Jack, Mary began using massage on thoroughbred race horses and on her own competing western pleasure horses. She marketed her skills at local racetracks and for competition horses. People all over wanted to learn her techniques. Mary developed her own program that included ideas from Russian Equine Sports Therapy. She massaged many horses. In fact, her goal is to massage as many horses in her lifetime as possible. To increase her reach, she decided to start teaching others equine sports massage therapy so that more horses could benefit from the therapy. In 1989, Mary founded Equissage, Inc., and its equine sports massage therapy certification program began. Elizabeth Wilson and Ann Melander are proud to be members of a growing health care field that assists the equine athlete in reaching its full potential. It gives them great satisfaction to help and provide relief to these noble athletes and friends. Elizabeth and Ann are Certified Equine Sports Massage Therapists and Members of the International Association of Equine Sports Massage Therapy. They received and completed their training in June, 1997 under the instruction of Mary Schrieber, founder of Equissage, Inc. Since that time, in working with massage therapy, they have learned just how important preventative measures are as well as corrective measures. 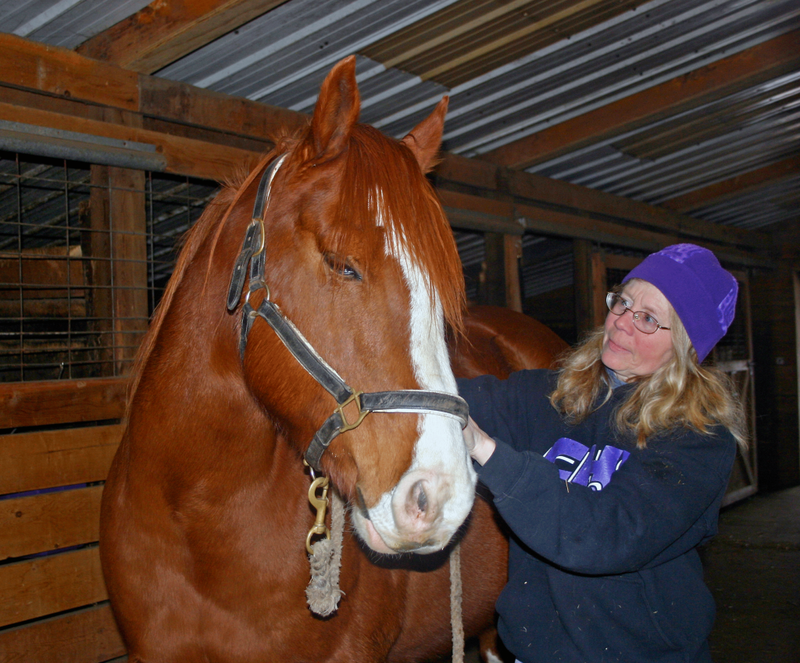 Elizabeth and Ann now offer equine sports massage sessions in northeastern Minnesota. A massage session takes approximately one hour to complete. The owner or caretaker needs to be present to hold the horse for the initial evaluation and massage. The massage session should be followed by hand-walking or light workout under saddle. The effects of massage may be immediate or may take several days. To be most beneficial, massage should be done on a routine basis. If requested, Bach Flowers or Young Living Essential Oils, or both, can be incorporated in to the session. Barn therapy sessions are $45.00 with extra fees for the Bach Flowers and for the Essential Oil. No machinery of any kind is used during a massage session.